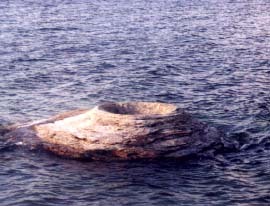 A Cone-Type Geyser - Cone-type geysers have a structure formed by geyserite above or just below the surface. The structure acts as a nozzle so the water and steam shoot into the air as a very forceful column. The larger the cone of a geyser, the more likely it has been around for a long time. This is a picture of White Dome Geyser along Firehole Lake Drive in Yellowstone National Park. White Dome Geyser shoots a stream of water in the air thirty feet high for 15 to 30 minutes. Intervals between eruptions vary from 10 minutes to 3 hours. 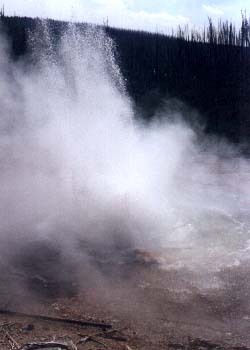 A Fountain-Type Geyser - Fountain geysers have a pool on the surface that fills before or while the geysers erupt. Because of this, these geysers erupt in bursts throwing spray all around instead of straight up. This is a picture of Echinus Geyser in the Norris Geyser Basin at Yellowstone National Park. Because of its location near a hillside, it is easy for observers to look down and watch the geysers pool slowly fill up, then overflow as the eruption approaches. Echinus is the largest acid-water geyser known and produces water almost as acidic as vinegar. It's eruptions vary from 1 to 4 hours. Echinus is named for the deposits surrounding it which look like sea urchins. 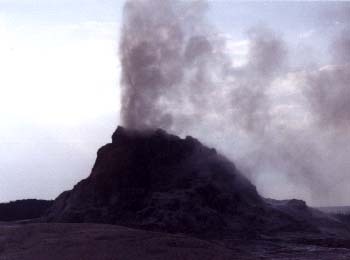 Dormant Hot Spring Cone - This 37-foot tall formation marks the location of a hot spring (and possible geyser) that stayed in one location for a long time. Over the years the geyserite built this tower-like structure. What is most unusual about it is that the spring did not seal itself closed as it built the cone. 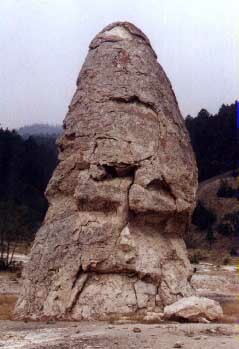 The formation was named Liberty Cap by the Hayden Survey team that visited Yellowstone in 1871 referring the peaked caps worn during the French Revolution. Liberty Cap is located in the Mammoth Hot Springs section of the park. Fishing Cone - This hot spring grew its geyserite cone in a lake. Early explorers came back to civilization telling how it was possible to catch a fish, then cook it by dropping it into a lakeside boiling hot spring without removing the fish from the line. While such antics are not allowed anymore, this hot spring retains the name. Fishing Cone is located at Yellowstone's West Thumb Geyser Basin. Copyright Lee Krystek 2001-12. All Rights Reserved.